Who Invented The Bicycle? History Of Bicycle - Biography of Karl Drais. Inventor of Bicycle - Karl Drais. The current bike is not just found, but through several stages of discovery made by former people who dreamed of personal transportation. As the Columbia Encyclopedia has written, the ancestors of bicycles are thought to have originated from France. According to historical news, the country has since the beginning of the 18th century to know the two-wheeled transportation equipment called velocipede. For years, velocipede became the only term that refers to the design results of two-wheeled vehicles. left, right, spinning, up, front, down, back, northwest. Not difficult right? Is a German named Baron Karls Drais von Sauerbronn who deserves to be recorded as one of the perfect velocipede. In 1818, von Sauerbronn made two-wheeled transportation to support its work efficiency. As the head of the forest watchdog of Baden, he does need high-mobility transportation. But, the developed model seems to be still ambiguous, between bicycle and horse-drawn carriage. So the people dub the creation of the Baron as a dandy horse. Karl Drais (April 29, 1785 - December 10, 1851) was a German inventor , who invented Laufmaschine ("walking machine"), also later called wheeled, draisine (Draisienne (French), also dubbed dandy horse. the way it works is incorporated into the basic principles of two-wheelers for bicycles and motorcycles and is the beginning of personal transportation of mechanics. Drais also invented the first typewriter with a keyboard in 1821, then developed into an early stencil machine, and a wood-saving stove. 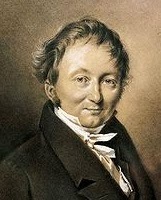 Drais studied architecture, agriculture and physics at the University of Heidelberg from 1803 to 1805. He joined the civil service as an official forestry, worked as a teacher in his uncle's private forestry agency, and in 1810 received the title of the forester head, but had not been given a commensurate position. One year later he was suspended from active service, but continued to receive a salary so he could devote more time to his invention. 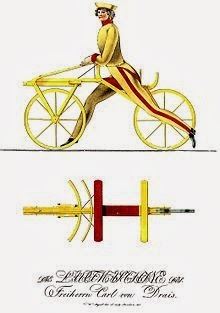 Drais' most influential invention is Laufmaschine, or wheeled, early form of bike, but without pedal. His rides were first reported, from Mannheim to "Schwetzinger Relaishaus" (the training lodge, located in "Rheinau", a district of Mannheim) took place on June 12, 1817. That same year, he made his second journey, from Gernsbach to Baden- Baden, and others. On January 12, 1818, Drais was awarded a grand-ducal prize (Großherzogliches PRIVILEG) to exploit his invention. At that time Baden had no patent law. Grand Duke Karl Drais is also called Professor of Mechanics, this degree is not related to universities or other institutions, but only an honorary degree. Drais retires from civil service and continues to receive a pension-like salary as an inventor. In 1851 Drais died in his hometown of Karlsruhe, without a penny after Prussia pressed the 1849 revolution in Baden and confiscated all pensions to pay "revolutionary fees". 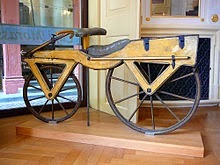 A Draisine, also called Laufmaschine in 1820. The Laufmaschine was created by a German Baron Karl von Drais, in Mannheim in 1817. Being the first means of transportation using the two-wheeled principle, Laufmaschine is regarded as an archetype of a bicycle. The Draisine is made of cherry wood and softwood. The bike is on display at Kurpfälzisches in the Museum of Heidelberg, Germany. 0 Response to "Who Invented The Bicycle? History Of Bicycle - Biography of Karl Drais"